The Aer Lingus flights scheduled to begin at Bradley International Airport in September are expected to attract a mix of business and leisure passengers . As they talked about the Aer Lingus flights set to begin at Bradley International Airport late next month, Kevin Dillon and Keith Butler used strikingly similar language as they discussed what the service means to their respective organizations. Indeed, Dillon, executive director and CEO of the Connecticut Airport Authority (CAA), which manages Bradley, and Butler, chief commercial officer for the Dublin, Ireland-based airline, said the timing for this venture is ideal, that the flight represents a key component of their respective growth strategies, and that it could be a catalyst for more developments of this type. And they were in agreement on something else, too: that a firm commitment from the region’s business community — with ‘region,’ in this case, meaning what has come to be called the Knowledge Corridor — is necessary for this venture to, well, get off the ground. Looking ahead, both the airline and the airport believe they will get such a commitment, in large part because their research — and especially the CAA’s — tells them there is considerable demand for such a service (more on that later). The Aer Lingus flight will depart Bradley just after 6 p.m., local time, and arrive in Dublin at 5:20 the next morning, meaning that someone could be in London (via a connecting flight) for the start of the workday there, said Butler. The return flight will leave Ireland at 2:20 p.m. and arrive in Hartford at 4:20. “You can essentially do a day’s work in Connecticut, hop on a plane, and immediately the following day do a full day’s work in London — if that’s what you wanted to do,” said Butler. The flights will be on a Boeing 757, with 12 business-class seats and 165 in economy. Those aren’t big numbers, but the impact of this flight could be enormous, said both Butler and Dillon. For Aer Lingus, now the fastest-growing airline in the world in terms of trans-Atlantic business, the Hartford flights represent another spoke in the wheel when it comes to a broad growth strategy that has seen the company add flights in several U.S. cities in recent years. 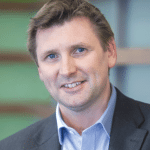 As for Bradley, the impact could be even bigger, largely because of what Aer Lingus has done in terms of broadening its reach, said Dillon, noting that, while the airport is, indeed, an international airport, that term is narrow in scope and limited to this continent. With the Aer Lingus flight, the definition will become much broader. Indeed, while the service will connect business and leisure travelers alike to the Emerald Isle itself — and there is ample demand for that — it will also bring convenient connections to dozens of other cities across Europe, meaning that travelers can begin their journey to those destinations by driving to Windsor Locks, not Boston, New York, or Newark, which represents a tremendous opportunity for the airport. For this issue and its focus on travel and tourism, BusinessWest takes an in-depth look at the Aer Lingus service out of Bradley, and at what it means for the airport, the airline, and, most importantly, this region. As part of this stated mission, the organization undertook extensive outreach to the Hartford-Springfield business community, with the goal of identifying ways to improve service to that vital constituency, said Dillon, adding that, while the results were not exactly surprising, they did provide the CAA with confirmation of what was wanted and needed, and thus a specific direction in which to move. Actually, several of them, as things turned out. He noted that one of the stated desires within the business community was for non-stop service to the West Coast, a need addressed through a partnership with American Airlines, which in June began service out of Bradley to Los Angeles International Airport (LAX). Go HERE for a list of Tourist Attractions in Western Mass. “So far, it’s proving to be a very popular service,” said Dillon, adding that the flight not only provides business and leisure travelers with better, easier access to the West Coast, but also to Asia, which has become an increasingly popular destination for both constituencies. But in many ways, the bigger stated priority was for trans-Atlantic flights, said Dillon, citing some eye-opening numbers gained through the CAA’s outreach. Bradley has long sought such service as a growth vehicle and means to make it the proverbial airport of choice for people in this region. And it had such service nearly a decade ago, when Northwest Airlines introduced non-stop flights to Amsterdam, but that venture was doomed by poor timing — sky-high fuel prices and then the Great Recession — and the service ceased in September 2008. Since then, Bradley and the CAA have been relentless in their quest to bring Europe back within its direct reach. But that sentiment hardly makes it unique. “There are a lot of airports that are very hungry for European connections — the competition is actually quite fierce,” said Butler with a laugh, noting that Aer Lingus, now celebrating 80 years in business, has had many suitors, and many attractive options, as it has weighed proposals for continuing and accelerating its strong pace of growth. Airports that want to prevail in that competition have to present opportunity in the form of a package of location, attractive conditions, ample opportunities to effectively market the service, and suitable demographics, meaning a mix of both leisure and business travelers looking for something more convenient than the available options. Hartford presented just such a package, said Butler, adding that it became an attractive addition to the airline’s existing Northeast-corridor service in and out of New York (JFK), Boston, Newark, and Washington (Dulles), for many reasons. “Hartford came about because it represented an opportunity to strengthen our position in the Northeast,” he explained. “It has strong cultural ties to Ireland, but also business relations. At the same time, we were also looking to try something different, and go into a secondary city. Indeed, the airline now flies to almost every major city in Europe — with 18 flights daily to London alone — as well as many destinations on this side of the Atlantic. The timing for such additions is appropriate, he went on, adding that economic conditions globally have improved greatly since the recession, and that is especially true in Ireland, meaning more people are flying out of airports there for destinations on both sides of the Atlantic. As for the Hartford flights, there will be four per week during the winter months, which Butler defines as October to March, and daily flights (all seven days) the rest of the year to accommodate greater leisure travel. Dillon told BusinessWest that the initial response has been quite solid, and he expects demand to remain steady, because of the high level of connectivity to European cities that Aer Lingus provides, and also the airline’s ability to provide pre-clearance for its passengers heading back to the U.S., a service that could save them a two-hour trip in the line at customs. The task at hand is to extensively market and promote the new flights and drive home to the business community the great opportunities that they provide. As mentioned earlier, while they were talking from much different perspectives, Butler and Dillon used markedly similar language about the service set to start Sept. 28. They both used the phrase ‘this makes perfect sense’ when talking about the flights, and for good reason. They add another dimension to the growth strategies for both organizations and open the door to new opportunities. Not only to the airport and the airline — but the region and its diverse business community. NORTHAMPTON — The state Legislature’s Joint Committee on Tourism, Arts, and Cultural Development continues its 2016 listening tours across the state in Hampshire County on Monday, May 9, beginning with a public hearing at 10 a.m. at the UMass Fine Art Center Concert Hall. This listening tour is part of a statewide series headed by state Sen. Eric Lesser and State Rep. Cory Atkins, committee co-chairs. Legislators from the committee and representatives from the Massachusetts Cultural Council, the Massachusetts Office of Travel and Tourism, and the Hampshire County Regional Tourism Committee will join community members, artists, and local business owners to discuss the economic impact the arts, culture, and tourism have on Hampshire County. Tourism is the third-largest revenue-producing industry in the Commonwealth. In 2014, domestic and international visitors spent $19.5 billion in the state. Statewide, the tourism industry employs 132,000 people. Visitors — defined as people who travel from more than 50 miles away — spent nearly $146 million in Hampshire County alone and support 870 jobs. An additional 3,300 jobs are dependent on tourism spending. More than 60% of these jobs come from independent artists and promoters, agents, performing-arts venues, and museums. The tourism industry has grown 20% in the last decade. 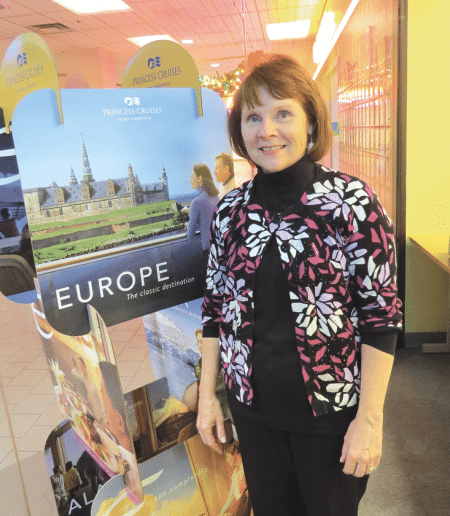 Janice Webb says that the strong dollar, coupled with a desire among Baby Boomers to see the world, is the prevailing force when it comes to travel in 2016. Janice Webb says three area couples put down their deposit for a trip to Paris for next April on the morning of Nov. 13, just hours before news of the terrorist attacks across the City of Light first broke on CNN. Webb, owner of Emerald City Travel in Springfield, circled back with the group the next day to see if they had any questions or concerns — or intentions to change their travel plans. They had some of the former, certainly, but none of the latter, she told BusinessWest, adding that the prevailing attitude was that, while the attacks that killed 130 people were alarming, they were not enough to prompt cancellation of a trip, which would continue with a river cruise to Amsterdam, that those involved have been looking forward to for most of their lives. “They all e-mailed back and said, ‘let’s do this and hope for the best,’ and that appears to be the common sentiment,” said Webb, a 30-year industry veteran who noted that the various forms of turmoil in Europe are colliding head on with a potent package — a weak euro combined with a powerful desire among retiring Baby Boomers and others to get out and see the world, or at least the homes of their ancestors. The latter is, by and large, the much stronger force at the moment. Roughly translated, this equates to expectations — for longer lines and tighter security at airports, armed soldiers at many popular tourist destinations in Europe, and, yes, possible incidents involving terrorism. As for the attacks in France’s capital city and their impact on travel there, he summed things up with a line he would utter more than a few times. But an attitude of defiance when it comes to not letting terrorism get in the way of a long-planned, long-dreamed-about trip to Europe also extends to Berlin, London, Venice, Belgium (despite the fact that Brussels was locked down for several days last month), and, to a lesser extent, Istanbul, although some cruise lines and travel companies are changing some itineraries in Turkey. For this issue and its focus on travel and tourism, BusinessWest looks at how recent events are spawning concern, but they’re not keeping travelers from reaching their destination — whatever that might be. As he talked about travel to Europe and why he doesn’t expect it to be seriously dented by the attacks in Paris and other terrorist actions in that part of the world, O’Meara started his explanation by detailing one of his company’s current offerings. It’s a package known as ‘Italian Vista,’ and it features eight days with stops in cities like Rome, Florence, Milan, and Venice, and includes hotel stays, meals, and guided tours. The price this fall was an already-attractive $1,999, and for next year, it’s a jaw-dropping $1,449. “That’s all due to the weak euro and the attractive exchange rates,” he told BusinessWest, adding that such sticker prices on trips across the continent help explain why bookings for 2016 are running roughly 13% ahead of the pace for last year, despite the attacks in Paris, the bomb that brought down a Russian airliner, the refugee crisis, and other forms of turmoil. The terrorist attacks in Paris were unnerving, but thus far, they do not appear to be a deterrent for those making plans to visit the City of Light. But overall, O’Meara says travelers are simply pausing before traveling to Paris and other destinations, and the sentiment within the travel industry is that they won’t be pausing for long, unless there are more incidents. Webb agreed. She said fall is the time when travel companies put out deals designed to fill cruise ships and hotels for the coming season, and thus far, travelers have not been shy about snapping them up. She said there are many factors at play when it comes to the ongoing surge in international travel — and travel in general. They include the strong dollar, which is now worth almost as much as a euro, when three years ago the rate was almost 1.4 dollars to the euro. But there’s more to the equation. Bad winters, especially the one in 2015, have promoted many to conclude that, to endure such punishment, they need to break it up with a week or 10 days someplace warm, usually coinciding with February school vacation. Adventure-packed destinations are still very much in vogue, which means Costa Rica is still hot, said Webb, adding quickly that many people young and old have already been there and done that, and now, most are just looking for a good deal and a good beach. Then there are the aging Baby Boomers, many of them with disposable income, and others as well, who want to visit places they’ve heard about or the country their family calls home. For many in this region, that means Italy or Ireland. “It seems like there’s lots of Irish and Italians in the Springfield area,” said Webb, who is booking lots of trips to both countries. But there is still another factor in all this, she went on, noting that, overall, events like those that took place in Paris have only a temporary impact on travel — if other conditions are favorable, such as the economy — and usually not a deep impact. An exception to that rule was 9/11, Webb added quickly, noting that the industry suffered greatly as business was frozen by uncertainty. But even then, there were groups and individuals who were undaunted and determined to seize opportunities. Whether this pattern continues in the wake of this tumultuous fall remains to be seen, but all indications are that it will. But while travelers will be undaunted, for the most part, they will also be more cautious, Webb predicted. She predicted that some may opt to travel with a group rather than visiting a city or region on their own, which is good for cruise-ship lines and tour operators. Meanwhile, others may seek out destinations deemed to be safe, or at least safer. Even within the confines of that ‘new norm’ O’Meara described, the terrorist attacks in Paris were certainly unsettling — for travelers and the travel industry. 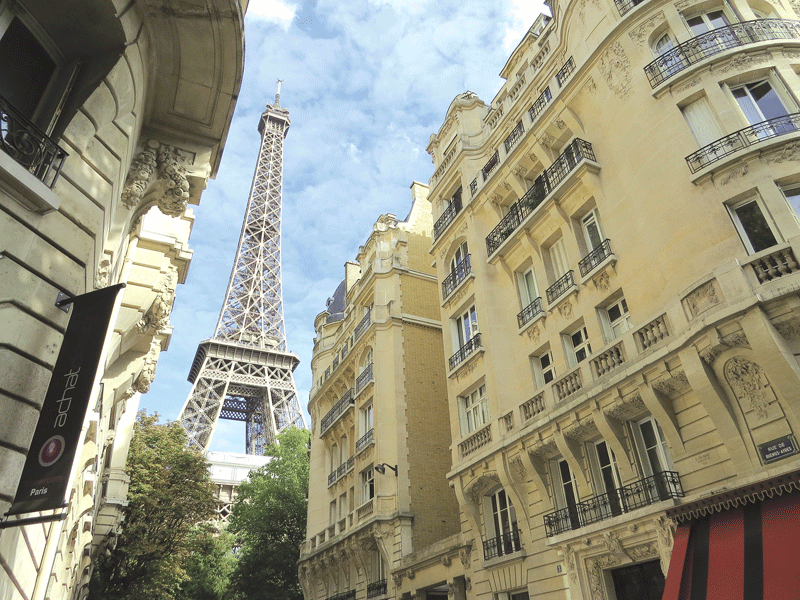 Thus far, though, it appears that the package of attractive fares, a strong dollar, a desire among Boomers to see the world, and ‘Paris being Paris’ is creating opportunities well worth the sum of the risks involved. Like those three local couples bound for Paris next spring, people are booking, and hoping for the best. 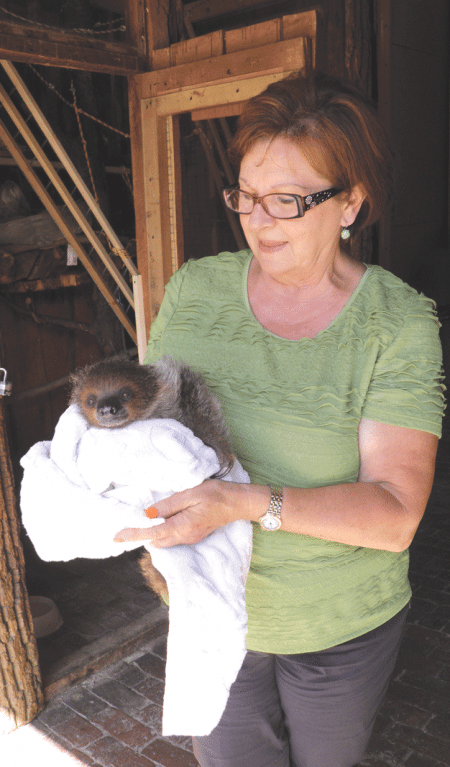 Joan Lupa shows off a baby two-toed sloth, one of many exotic animals that have found a home at Lupa Zoo. It’s early in the morning at Lupa Zoo. And while visitors have yet to arrive, the creatures that live there are doing all they can to make their presence known. Laughing kookaburras have been screeching since 4 a.m. to announce a new day, macaws are squawking loudly, monkeys chatter excitedly as they execute gracious leaps in their cages, and the braying of donkeys echoes throughout the entire 15-acre park. But the sounds don’t penetrate into the community; although the sanctuary houses more than 300 species that include a giraffe, llamas, two camels, a menagerie of monkeys, a black leopard, a large reindeer, a zebra, arctic foxes, bears, and oddities such as capybaras (large rodents from South America), it’s a hidden treasure that cannot be seen or heard from the front gate on Nash Hill Road in Ludlow. When visitors pass through the gate, they travel along a long driveway that leads to a spacious parking lot. The roadway is peppered with cages that house strutting ostriches and other animals, and when they leave their vehicles, guests enter an exotic world created by Henry Lupa and his wife Joan, who painstakingly carved out a habitat for animals in the deep woods behind their home with enclosures that mimic what each creature would find in its natural environment. Joan glows as she talks about their venture into the unknown and its success, and is tearful when her late husband Henry is mentioned. They were married for 48 years before his passing two years ago, and the zoo was a dream he nurtured for years before they brought it to reality in a way that exceeded their wildest imaginations. 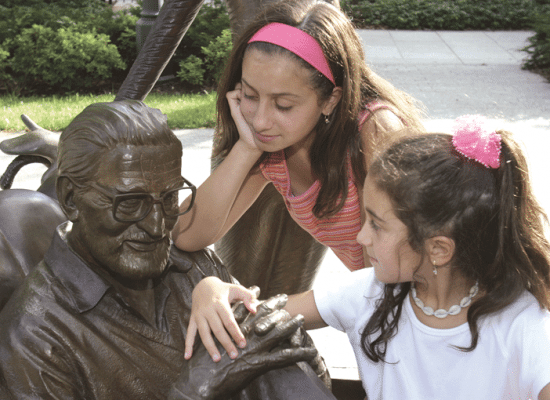 “Henry wanted to create a natural habitat for animals that would serve the community,” Joan recalled, as she spoke about her husband’s living legacy, adding that it’s a very good place for children as well as adults, who stroll along the shaded brick walkways and relax on benches as they watch the animals and learn about species from all over the world. Her pride in and passion for the venture is evident as she talks about the school groups it hosts and the excitement the zoo generates in visitors, how her son brings some of the animals into inner-city schools and nursing homes to educate people and make them happy, and how the family does everything possible to keep entrance fees affordable so the zoo is accessible to everyone. It’s no easy feat, because the annual operating costs for the privately owned operation are $400,000, which doesn’t include the cost of snowplowing and other services provided by the family’s company, N.L. Construction, which started out as Henry’s landscaping business and morphed into a larger entity, thanks to hard work by him and Joan, who always played a major role in the business. 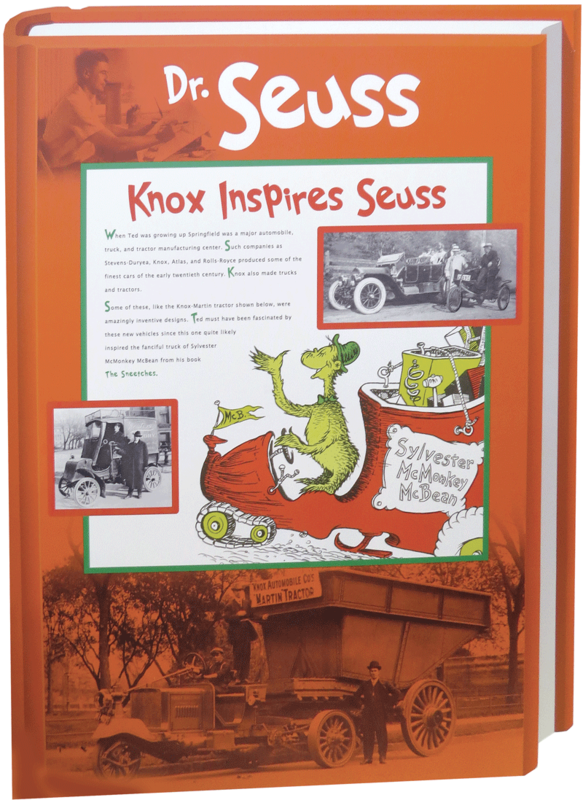 That same company, which specializes in commercial projects, including schools, fire stations, and other municipal buildings, provided the bulk of the money needed to build the zoo and the funds needed to maintain it. And although Joan refers to it as a “hobby,” much of the endless labor required to keep the zoo open is donated by family members who don’t earn a salary. They include Joan; the couple’s son Wally, who is a veterinary assistant; his wife Ewa, who does the bookkeeping; and Joan’s two grandsons. The business community also plays a small role in the upkeep: some companies sponsor an animal, while others send volunteers to do much-needed work. For this issue and its focus on travel and tourism, BusinessWest looks at how Henry Lupa’s dream became reality, and how his family continues to keep that dream alive. Joan and Henry grew up on small farms in Poland that were self-sustaining. They emigrated to the U.S. in 1964, married a year later, purchased a 32-acre parcel in Ludlow in 1976, then bought their house and an additional three acres when the adjacent parcel became available, then added 13 more adjoining acres in 1991. They had grown up with animals, and by the ’70s, Henry was raising pheasants and miniature horses. “They were our pets, and he did it for our family’s enjoyment,” Joan said, noting that, by the ’90s, the neighborhood children and their sons’ friends made a habit of visiting frequently to see their small menagerie. After Henry emigrated, he started a landscaping company, which he grew into the highly successful N.L. Construction business, in which Joan played an active role. They were very busy with their business, home, and family, so she was shocked one day when he told her he wanted to open a zoo. Lupa Zoo’s giraffe enjoys some branches fed to him by Joan Lupa, who stands on a high platform built so guests can enjoy the experience. It’s a storied history well worth recounting, as the couple turned an idea that seemed … well, nearly impossible, at least to Joan, into a reality that grew beyond anything they envisioned. “You start something, and when you come to the point where it is well-received by the community, you just can’t stop and go back. You have keep going,” Joan said. So, although the construction company continued to thrive, after Henry retired due to health issues, he devoted himself entirely to the zoo, and Joan continues to work there year-round. But talking about the past takes away from the excitement of the zoo, so she jumps up, eager to show off its occupants. Her first stop is inside one of their two heated barns, which are backed up by generators and used to house many of the animals during the winter. She heads straight for her newest favorites, twin baby two-toed sloths. “I’m going to take the female out; the male tends to bite,” she said as she reached inside and removed a baby who stuck its head out, then buried it in the towel she held beneath it. Joan told BusinessWest that visitors are allowed to feed the hoof stock with compressed hay and grain they buy on the premises and place in tubes, but no one is allowed to have direct contact with any of the animals. However, an exception is made for their most famous resident — a 20-foot-tall giraffe they’ve owned for 15 years. A special staircase was created so patrons can climb to see its face and feed it carrots and branches from nearby trees, and it takes his time and chews slowly as Joan offers it a handful of food. After leaving the giraffe’s enclosure, she pointed out other animals, providing details about their personalities. She knows them all, and even though the zoo houses many endangered species, every creature in it was carefully chosen. “You have to study where it comes from to figure out the kind of environment it will need and the size of its cage; we do whatever we can to make our animals comfortable, and we do it for all the right reasons,” Joan explained, adding that their exhibits mimic the species’ natural environments. Since the ability to hide is important to the health and well-being of many of the creatures, sometimes visitors have to take time to look closely to discover where they are. The zoo’s newest additions are a pair of Asian river otters. “We got them this spring, and they’re very, very playful,” Joan said as she stood near their enclosure and watched them roll over and over near a fast-moving water slide. 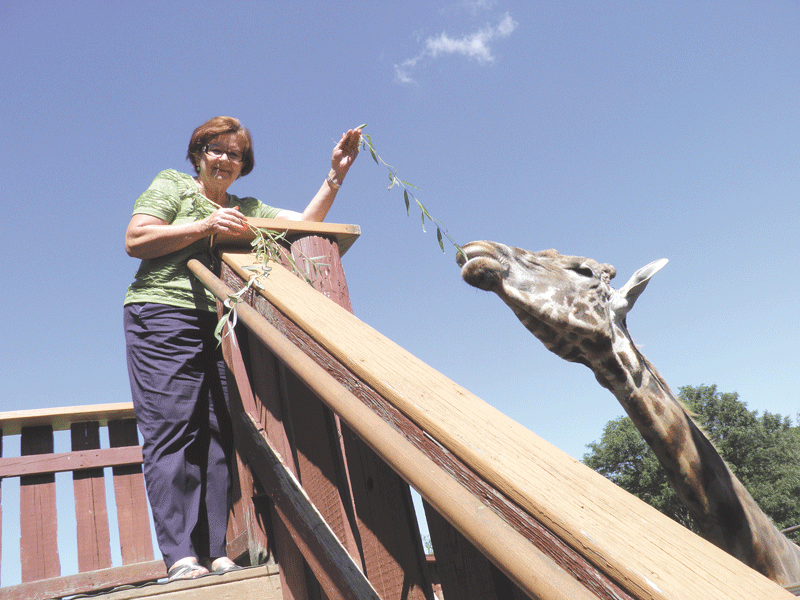 She told BusinessWest that the upkeep of the zoo and maintenance of the facility is never-ending. But the work the family has done and continues to do is a labor of love and has less to do with meeting government regulations than ensuring that the animals and patrons are happy. As she walked, she added that the cost of building the zoo was mitigated in part by the fact that the family’s construction company used recycled materials it obtained when it demolished old structures to build it. Joan pointed them out during the tour; they ranged from bricks used to create the walkways to large boulders inside cages, to a railing taken from the grounds of a school in the Berkshires. “We used all of our resources, and instead of throwing away lumber, we recycled it; most of the fencing comes from job sites, and a lot of it was donated by local contractors,” she noted. Many of the extras in the zoo are paid for by grants, such as the signs outside each cage that contain the name of the animal inside, a map showing its natural habitat, and printed information about its lifestyle and habits. State grants distributed between the Commonwealth’s three zoos also help; last year Lupa Zoo received $60,000, and this year it was given $46,000. “We really hope Governor Baker doesn’t cut these funds because they help us keep the admission price low. It’s only $6 for each child in a school group as well as their chaperones, and we do everything in our power to keep it affordable because many of the students who come here are from low-income families,” she noted. Joan and her family are happy the zoo has flourished and hope it will serve the community for generations to come. It contains a playground that was added six years ago and is bordered by a beautiful raised garden; an area with fiberglass animals that children can sit on and have their photos taken; and also a concession stand, gift shop, educational center, and two large pavilions with picnic benches where people can relax and enjoy a snack in the shade. There is also a replica of a blacksmith’s shop because Henry’s father was a blacksmith in Poland, and a small area with a miniature merry-go-round and other pint-sized rides. 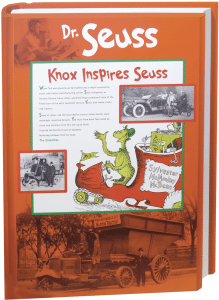 But the main attraction is the animals, which is exactly what Henry hoped for, and the entire zoo is a living legacy that continues to grow. The success of the endeavor has been astonishing, especially to Joan. “In my wildest dreams, I never thought this would become such a popular place. The initial permitting process was difficult, but it you are determined to do something and have a good intention, you can get it done,” she said. “Henry’s dream is a reality, and we will do our best to keep it going as the patrons who come here really enjoy it. Berkshire East’s new mountain coaster opened last October and has earned the distinction of being the longest alpine mountain coaster in North America. In the fall of 1976, Roy Schaefer drove his family from Michigan to Charlemont to look at Thunder Mountain Ski Resort, which was about to go bankrupt. Although it was failing, Schaefer was optimistic that he could bring it back to life, and he and a partner purchased it from Greenfield Savings Bank for $1, plus a debt of several hundred thousand dollars. Schaefer renamed the resort Berkshire East, and although his hard work and dedication paid off, he dedicated only the fall and winter months to the operation. “My father and his partner operated a ferryboat company in the summer on Mackinaw Island in Michigan, and when the ski area ended, all of their energy shifted there,” said Roy’s son, Jonathan Schafer, who co-owns Berkshire East Mountain Resort with his family. However, Roy and his partner kept the area alive, and it became a place where generations of families learned to ski. But, because it was a seasonal operation dependent on weather, he battled Mother Nature for decades. However, his commitment and belief that outdoor recreation is a sustainable model for economic growth not only helped area businesses and provided seasonal employment, but was passed on to his four children. Today, the resort is undergoing a $5 million transformation and is ushering in a bevy of recreational activities designed to transform it into a year-round destination that offers not only alpine skiing, but snow tubing, ziplining, mountain biking, whitewater rafting, and the opportunity to ride North America’s longest mountain coaster. The family also added overnight accommodations to the resort last September by purchasing the nearby, 530-acre Warfield House Inn and Farm, a bed and breakfast located just over a mile from Berkshire East that operates as a working farm complete with llamas, cattle, chickens, and gardens. Jonathan has worked alongside his father for years, and says he and his brothers developed their own vision for expanding the family ski resort into a year-round retreat years ago. “We were all ski racers who traveled the world, and due to our racing, we got to see a lot of things: bungee jumping in New Zealand, mountain biking, and other amazing activities,” he said. “We knew that we wanted to bring them to Charlemont and also realized that the Berkshires compare to any mountain range anywhere. The vision morphed into reality in 2008, when Jonathan’s brother, James, who lives in New York City, bought out his father’s business partner in Michigan. Change began almost immediately, and in 2009, Berkshire East installed its first new recreational venue, Zipline Canopy Tours, that would change its status from a winter resort into one that offered year-round activities. For this issue and its focus on travel and tourism, BusinessWest looks at the many changes and additions at Berkshire East, and how the resort is now at the top of its game — in more ways than one. The expanded venue has been a success, and people can choose three different zipline options that begin with a ride up the mountain on a chair lift that offers panoramic views of the Deerfield Valley. The descent is exciting, moving from platform to platform through mountainous terrain, and Zipline Canopy Tours was named by USA Today as one of the top 10 ziplines in the nation. “The tours are guided and were built to fit in with the landscape. It’s a great adventure that lasts two to two and a half hours,” Jonathan said. The Schaefer family has always strived to be in tune with nature, and in 2011 they installed a wind turbine, followed by a 10-acre solar field in 2012. “We were the first ski area to produce all of our own electricity, and we remain the only ski area in the world to produce renewable energy on site,” Jonathan told BusinessWest. Berkshire Whitewater will begin offering rafting trips in May, with a variety of excursions designed for people of different ages and abilities. Another new attraction has increased business and added to the operation’s year-round status. It’s a 5,400-foot, all-season mountain coaster that opened last October on Columbus Day weekend. The mountain coaster is one of them, and it’s a noteworthy attraction. “It is the longest mountain coaster in the nation and the third-longest in the world. It’s powered by our wind turbine and solar panels, and is an inviting way for people to enjoy the outdoors, as there are no fitness or skill requirements,” Jonathan said. The coaster’s construction proved to be an extraordinary engineering feat, because each section had to be designed to adapt to the contour of the mountain with minimal impact to the landscape. The sections were installed in 10-foot lengths, and each car is towed up the mountain by a stainless-steel cable and strategically released when it reaches the top. “Each car is independent of the others and has its own braking system, which allows people to slow down or speed up by pulling on the handles,” Jonathan said. “However, if one car gets within 80 feet of another going down the mountain, the brakes automatically stop it. The new attraction has attracted coaster enthusiasts from across the nation, and groups have already booked trips there this summer. Berkshire East enjoyed a cooperative partnership with Moxie Outdoor Adventures for years, and recently acquired its Deerfield River rafting operation. It has been renamed Berkshire Whitewater, and although it kept most of Moxie’s river guides, Berkshire East purchased 10 new rafts designed exclusively for the river, along with other state-of-the art equipment. Trips will be available five days a week and will begin when the hydroelectric Bear Swamp Generating Station releases water, which is done on a regular, scheduled basis. Since it stores approximately 1.7 billion gallons of water almost 800 feet above the river, when it is released, it turns the river into an ideal spot for rafters, kayakers, and downriver canoeists. A variety of adventures along different sections of the river are planned for different age groups and abilities, but all rafters will receive a 20-minute safety lecture before they leave. A picnic lunch is provided for people who opt for one of the easier excursions, while another, more advanced course ends with a barbecue. Each trip lasts four or five hours, and there are options to satisfy everyone, including a leisurely, half-day float trip that families with children ages 5 and up can enjoy. “They float along in a whitewater raft, and there are places for them to get out, splash around, and swim,” Jonathan noted. In addition, guided kayaking trips will be offered daily, and children ages 5 and up can accompany an adult in a boat on the four-hour adventures. Since some people have already rafted on the Deerfield River, Jonathan said, Berkshire Whitewater is offering trips on the Millers River, east of Greenfield, and the West River in Jamaica, Vermont. “But they all start here, and people are taken to those sites in vans,” he told BusinessWest. 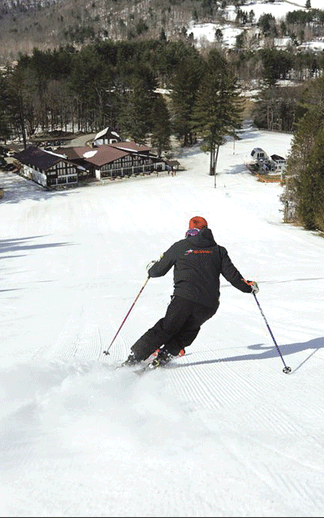 Despite the resort’s all-season changes, skiing remains a major part of Berkshire East’s roster of offerings. The Schaefer family is also building a new mountain-biking park and commissioned a group from Whistler Mountain, whose track record includes building the largest and most dynamic bike trail in the world, to construct 10 miles of trails down the mountain. “We plan to open the park in early July and will have a major focus on beginners, with a learn-to-ride program,” Jonathan said. Meanwhile, because the Schaefers know that many people want to enjoy their resort for more than a day, the purchase of the mountaintop complex that contains the Warfield House Inn will allow them to offer overnight lodging. “It was a logical move because there was no housing at the ski area and this was a beautiful facility that needed new life. We thought it would be a great complement to our business,” he said. The bed and breakfast, which was recently renovated, contains a meeting facility, restaurant, and pavilion with mountaintop views. “It’s a gorgeous place to get married,” Jonathan said, adding that the farm is also known for its maple-sugaring operation, producing about 1,000 gallons of the sweet treat each year. Over the past few years, Berkshire East also installed a new Sky Trac Quad chair lift, with the help of a helicopter and an army of loyal employees, that can deliver 2,400 people an hour to the top of the mountain to ski, mountain bike, hike, and enjoy other outdoor activities. He added that his brother Bill, who lives in Iowa, is part-owner of the whitewater-rafting business and has purchased rental properties in the area; his brother Tom, who lives in California, has also purchased rental properties; and he, his brother James, and their father run the day-to-day operation of the resort and remain committed to providing healthy, recreational outdoor activities. Today, the family is excited about the expansion, and their goal is for Berkshire East to become known as “New England’s Outdoor Adventure Center,” Jonathan said. We understand that Massachusetts Gov. Charlie Baker has a huge budget deficit to close — more than $750 million, by most estimates — and we don’t intend to overanalyze his efforts to do so, because almost all budgets are unpopular — and debatable. But his announced intentions to slash funding for both the Mass. Office of Travel and Tourism (from $14.2 million to $6.1 million) and the regional tourism councils (from $5 million to $500,000) represent a tack we wouldn’t recommend. That’s because the tourism sector is becoming an increasingly important contributor to the state’s economic health and well-being, and it will be even more so in the years to come as the casinos currently on the drawing board open their doors to the millions expected to visit those resorts each year. And also because, in this sector, perhaps even more than in some others, you really do have to spend money to make money. Already, state legislators who understand the importance of tourist dollars to the cities and towns they represen are casting serious doubt about whether the governor’s proposal will fly, and we hope they’re right in their assessments. Dollars spent to promote the state and individual regions like Greater Springfield, the Berkshires, or the Amherst-Northampton corridor are not so much expenditures as they are investments, and the new governor’s administration needs to recognize that and find another way to trim some $12 million from the budget. In a way, we can understand the administration’s thinking with regard to tourism funding, especially given the dearth of attractive options when it comes to cutting the budget. After all, the Commonwealth’s major attractions and convention facilities are not exactly state secrets, and Internet-savvy site finders have a wealth of information at their disposal. But as traditional sources of employment and economic vitality (especially manufacturing) have declined in recent years, competition for tourism dollars has become increasingly intense. And in this environment, visibility is critically important. Even states and cities that have long been popular destinations, spots that one might think wouldn’t need to advertise — Florida, California, Hawaii, New York City, and Las Vegas all come to mind — have invested millions in keeping themselves front and center when it comes to the minds and wallets of tourists. Such a mindset has created a good amount of momentum locally, especially with regard to conventions and meetings. Greater Springfield is an attractive — and reasonably priced —alternative for convention planners, and these assets have been a big factor in an increase in bookings in recent years. And now, those pushing this area as a convention or meeting site have something more to sell — the resort casino that will soon be taking shape in Springfield’s South End. That’s an attractive addition, one that has the potential to make this area a real player in that segment of the tourism industry and one that should open some doors that were previously closed. But for that door to open all the way, this state and this region have to be able to promote themselves — and now. Indeed, many conventions are booked years in advance, and now is the time to strike. As we said at the top, closing a $750 million budget gap will be difficult, and it’s easy to say ‘don’t cut here’ or ‘don’t cut there.’ But in the case of funding for the Office of Travel and Tourism and the individual convention and visitors bureaus, cuts now could have some serious consequences later. Kay Simpson says creation of a cultural district will help Springfield brand its many attractions, while spurring economic development. Though he quickly acknowledged that the analogy isn’t perfect — the city hasn’t actually changed leadership at the top, and won’t for at least a few more years — he went ahead with it anyway, because he considers it an effective way to talk about what the creation of a cultural district in Springfield can and likely will do for the community. Creating a cultural district can do very much the same thing for Springfield, he went on, noting that it will help the city brand itself and its many cultural attractions and, in many ways, give people a reason to give the community a look — or another look. Kay Simpson agreed. 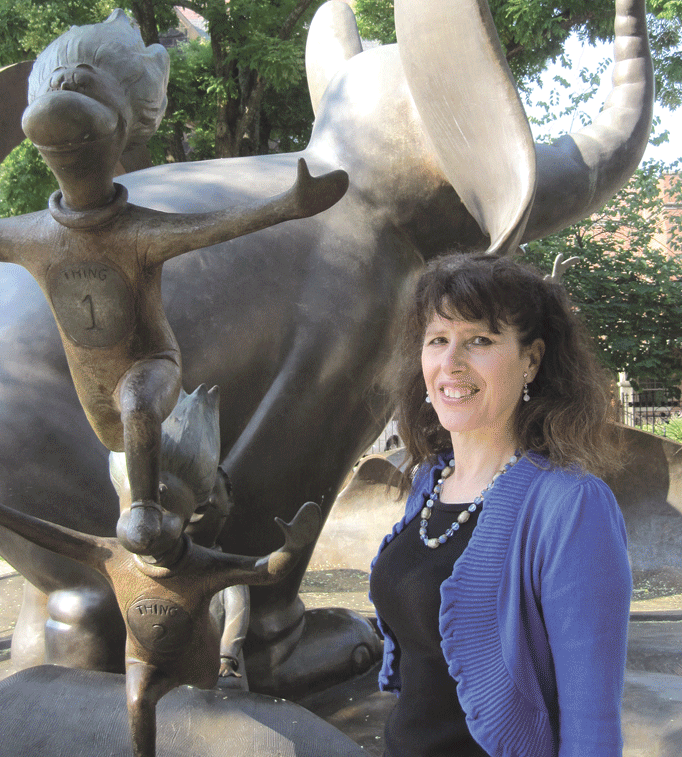 She’s the vice president of Springfield Museums and one of the primary architects of a proposed cultural district that would cover several blocks downtown and include everything from the Armory Museum to the Paramount; from the Community Music School to the five museums in the Quadrangle; from Symphony Hall to the clubs on Worthington Street. The formal application for creation of the district was sent to the Mass. 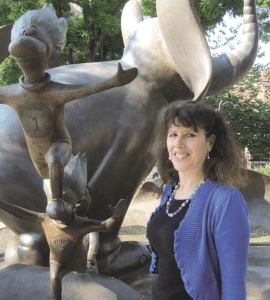 Cultural Council (MCC) on Aug. 15, said Simpson, who literally knocked on some wood as she talked about what she considers decent odds that the city will join Pittsfield, Easthampton, Lowell, Gloucester, and other cities gaining state designation for a cultural district. Her optimism about the proposal’s chances is based on comments made by MCC officials who have walked the planned district already and provided input on the application and how it should be written, and also on the large volume of attractions and institutions packed into the multi-block area identified in the map to the right. David Starr concurred. The president of the Republican and chair of the city’s Cultural Coordination Committee described the planned district as a “true gem,” and said its creation will provide new and potent opportunities to increase awareness of the city’s cultural amenities and build on that foundation. 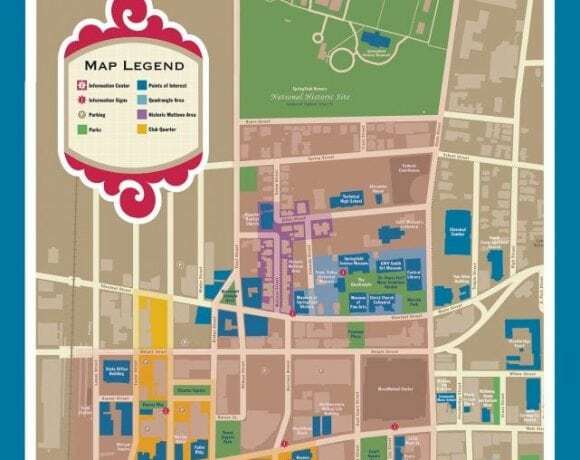 For this issue and its focus on travel and tourism, BusinessWest takes an in-depth look at the proposed cultural district and what its architects believe it can do for the city and its ongoing efforts to revitalize the downtown area. The MCC’s Cultural Districts Initiative was authorized by an act of the state Legislature in 2010 and launched in 2011. It was inspired by mounting evidence that thriving creative sectors stimulate economic development, said Simpson, noting that the prevailing theory has been that such districts attract artists, cultural organizations, and entrepreneurs, while helping specific communities create or strengthen a sense of place. “By having the cultural-district designation, you’re creating an environment where all kinds of businesses can come into an area,” she explained. “These creative-economy businesses include everything from art galleries to graphic-design enterprises to coffee shops and restaurants. There are currently 17 cultural districts across the state, with more being proposed. They have been established in Barnstable, Boston, Cambridge, Concord, Easthampton, Essex, Gloucester (which has two), Lowell, Lynn, Marlborough, Natick, Orleans, Pittsfield, Rockport, Sandwich, and Shelburne Falls. Springfield’s proposed cultural district would be bordered by East Columbus Avenue, Bliss Street, Stockbridge Street, High Street, Federal Street, Pearl Street, Dwight Street, Lyman Street, and Frank B. Murray Street, according to a prepared summary. 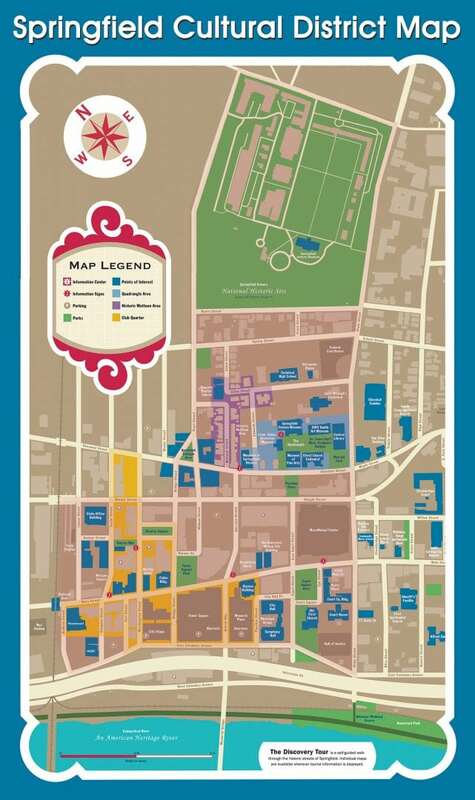 That section is home to number of cultural attractions and institutions, including the Springfield Armory National Historic Site, the Quadrangle, the historic Mattoon Street area, the MassMutual Center, Symphony Hall, CityStage, the Paramount, and the Community Music School, said Simpson, adding that it also includes several parks, some retail areas, and a number of restaurants, clubs, and hotels. One of the required traits of a district, as set down by the MCC, is that it be walkable, said Simpson, noting that, while this comparatively large area — which officials originally thought might encompass two districts — constitutes a “good walk,” it meets that stipulation. 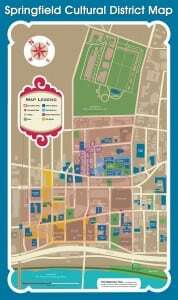 Most of the existing cultural districts have names that identify a specific neighborhood, landmark, or street. 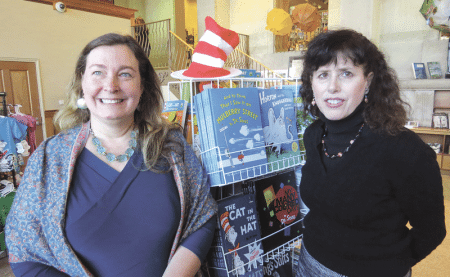 Easthampton’s, for example, is called the Cottage Street Cultural District, a nod to the many former mills and storefronts on that thoroughfare that have become home to arts-related businesses and agencies. Meanwhile, Lowell’s Canalway District takes its name from an historic section of that former textile-manufacturing center, which has also become a center for the cultural community, and spotlights the city’s most enduring character trait — its canals. Those leading the drive for Springfield’s district recently ran a contest to name it; submissions are currently being weighed by a panel of judges, and a winner is to be announced soon. By whatever name the district takes, it is expected to become a point of reference for Springfield, a vehicle for branding the City of Homes, and a source of momentum as the community seeks to build its creative economy and, overall, bring vibrancy to a long-challenged section of the city, said Plotkin. In a big-picture sense, the broad goal behind the cultural district is to change the conversation about Springfield, he went on, adding that, in recent years, most of the talk has been about financial struggles (the city was run by a control board for several years), crime, poverty, and high dropout rates in the city’s high schools. “This cultural district will build a sense of community,” he noted. “It will help break down some of those walls that people have about Springfield, including the sense that we’re a broken city with low self-esteem. It can also help make a community more visible — and attractive — to those looking for landing spots for a company or sites for everything from day trips to meetings and conventions, said Simpson, who said creation of a cultural district in Boston’s Fenway area has apparently done all that. Springfield will probably find out sometime this fall if its proposal for a cultural district has been accepted by the MCC, said Simpson. If all goes as those behind this initiative believe it will, then the city will soon have a new vehicle for marketing itself and perhaps making some real progress in ongoing efforts to change some of the perceptions about the community. 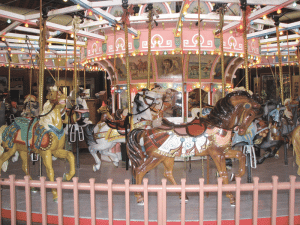 The Holyoke Merry-Go-Round marks 20 years in operation at Heritage Park this December. Thus, this is a time of reflection and celebration in Holyoke, concerning both the remarkable story of how residents and businesses in the city rallied to keep the attraction within the community, and the success enjoyed since: more than 1 million riders, hundreds of events staged at the facility, restoration of nearly half the ride’s hand-crafted wooden horses, and the creation of untold memories for generations of area residents. There will be many opportunities to rejoice and look back this year, with the highlight being a huge fund-raising gala at the Log Cabin Banquet and Meeting House on Sept. 19, an event that is expected to severely test the facility’s fire-code capacity. But for those most closely involved with this landmark, known to them as PTC 80 (the 80th carousel built by the Philadelphia Toboggan Co.), this is a time for much more than celebrating — although they will do plenty of that. It’s an occasion to do some strategic planning and take important steps that will ensure there are many more anniversaries to celebrate down the road. Friends of PTC 80, as it’s called, will mark its milestone anniversary with an eye toward ensuring that there are more of these celebrations for decades to come. Elaborating, she said the Friends of the Holyoke Merry-Go-Round, as this group is called, is engaging in discussions about hiring a full-time executive director for the facility, an individual who will assume many duties currently carried out by those volunteers, from fund-raising to marketing, while also taking on the primary assignment — maintaining the relationships that have enabled this city treasure to survive and thrive, and creating new ones. Hiring a director is one of many suggestions forwarded during strategic planning sessions staged recently with a consultant, Jeff Hayden, former city development director and current director of the Kittredge Center, said Maureen Costello, administrative manager of PTC 80. Others include everything from recruiting additional board members to developing and implementing a marketing plan; from multi-faceted efforts to increase visitation to a host of initiatives to increase revenues, especially the scheduling of more birthday parties and other events. These steps are in various, but mostly early, stages of implementation, said Costello, noting that one important step — a doubling of the price of a ride to $2 after more than 18 years — was undertaken in 2012. 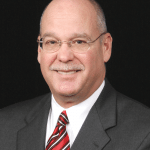 There will be more difficult and far-reaching steps taken in the months and years to come, said Jim Jackowski, business liaison and customer service and credit manager for Holyoke Gas & Electric and current president of the Friends board. He noted that, while the attraction’s first two decades in operation could be deemed an unqualified success, these are tenuous times for independently operated carousels like this one. The challenges are many, and include everything from the high cost of insurance (carousels have historically had high mishap rates, although this one hasn’t recorded any) to the escalating competition for the time of young children (the ride’s lifeblood) and their parents. 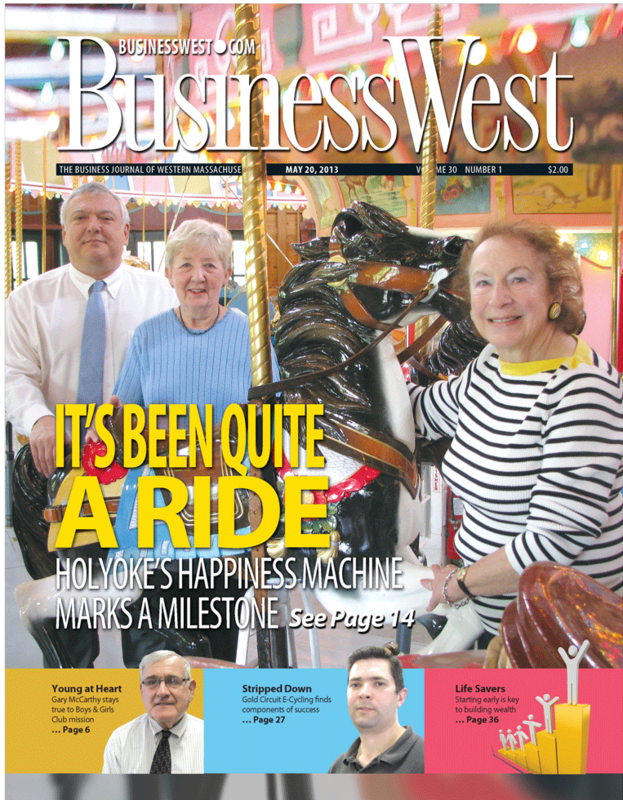 For this issue and its focus on travel and tourism, BusinessWest takes a quick look back at how PTC 80 remained a Holyoke institution, but a more comprehensive glance ahead to the challenge of making sure the happiness machine will be there to create memories for future generations of area residents. ‘Middle horse #5’ is next in line for a complete restoration. 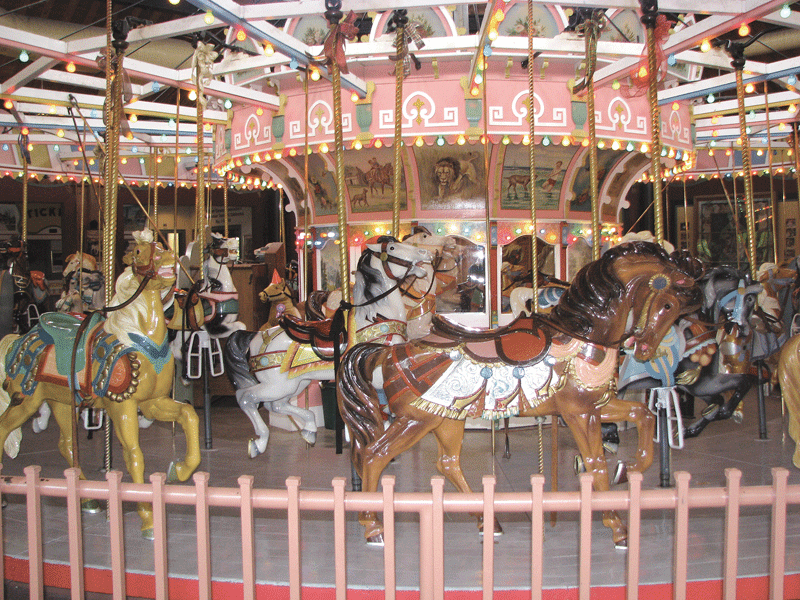 To date, nearly half of the horses on the carousel have been refurbished. 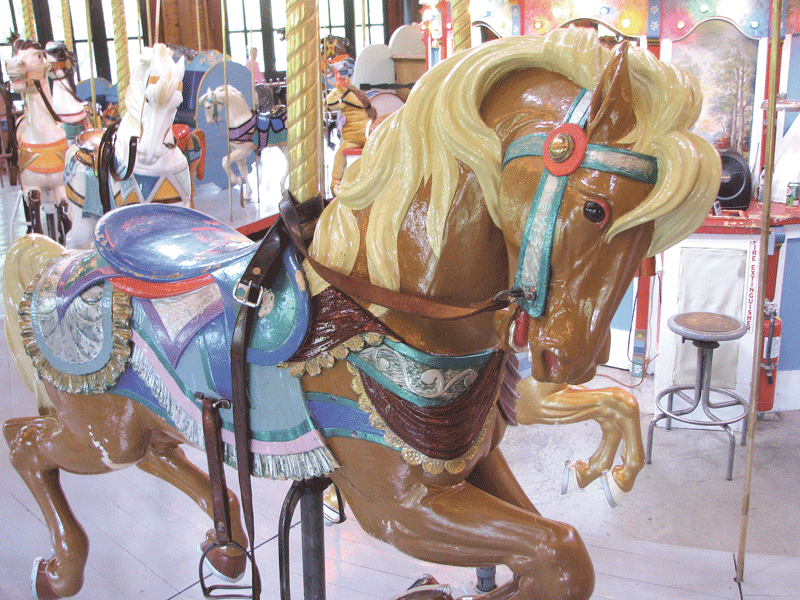 It’s known simply as ‘middle horse #5.’ And that says it all — if you know this carousel. It has three rows of horses (there are 28 in all, both ‘standers’ and ‘jumpers,’ with two chariots), with the largest animals on the outside and the smallest on the inside. This particular specimen is fifth in a sequence known only to those intimately involved with this attraction. And it is showing some definite signs of wear and tear, much of it caused by the buckle on the stirrup, which has knocked off badly faded paint in several areas. As a result, it is next in line for restoration work that will make it look like the much shinier and newer ‘middle horse #4’ just ahead. This work, to be carried out at the New England Carousel Museum in Bristol, Conn., will cost roughly $5,000, said Costello. To help pay that cost, the merry-go-round is staging a raffle this summer, with the winner gaining the right to give the horse a real name — like ‘Lancelot,’ ‘Flower Power,’ and others that have been assigned to other animals on PTC 80. 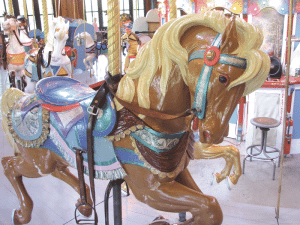 Restoring horses, staging raffles, and giving names to the stars of this attraction have been some of the many aspects of that labor of love which Wright described, made possible by the truly inspiring story of how Holyoke came together to keep its carousel a quarter-century ago. Most in this region are now at least somewhat familiar with the saga, which began with Mountain Park owner Jay Collins’ decision to shut down the popular tourist attraction after the 1987 season ended. After unsuccessful efforts to sell the park, the 300 acres it sat on, and all the equipment and inventory as one package (asking price: $4 million), Collins opted to start selling off the pieces. He had some attractive offers (up to $2 million, according to some accounts) for PTC 80, which was in extremely good condition. And while he was considering them, John Hickey, then manager of Holyoke’s Water Department, approached him with a plan to keep the carousel in the city. The two agreed on a price of $875,000, and Collins gave Hickey one year to raise the money. The rest, is, well, history. In the end, residents, business owners, and schoolchildren heeded those calls, raising enough money to buy the carousel and build it a new home in Heritage State Park. Thus, PTC 80’s second life began in December 1993. To say that it’s been a smooth ride since then would oversimplify things, said Wright, who noted that there have been many challenges over the first two decades, from getting people to come to downtown Holyoke to attracting revenue-generating events, such as birthday parties and weddings, to overcoming the loss several years ago of the four-day Celebrate Holyoke event that gave the carousel much-needed exposure and ridership. The attraction has managed to remain in the black throughout and meet its annual budget of roughly $100,000, he noted, largely through perseverance, imagination, and resourcefulness. But if PTC 80, one of only 100 antique classic wooden merry-rounds still operating in North America, is to keep its Holyoke address, it must continue to act as a small business would, and that means strategic planning and, as Wright and Costello said, succession planning. That later assignment is a difficult one for many small businesses to even acknowledge, let alone address, said Wright, adding that it’s the same with the merry-go-round, where this exercise takes a number of forms. For starters, it means active recruiting of younger professionals within the community to join the board and become involved with the carousel, she said, adding that a new generation of leadership must eventually take the reins — literally and figuratively — from the group that waged the campaign to save PTC 80 a quarter-century ago. Succession planning also means developing and advancing a plan to hire a full-time executive director, said Costello, adding that the merry-go-round has a part-time operations manager (15 hours per week), and there are others who have held that position in the past. Succession planning is just part of the discussion when it comes to securing the long-term future of the merry-go-round, said Costello, adding that strategic planning initiatives involving the attraction, like those staged for businesses of all sizes, have focused on that acronym SWOT — strengths, weaknesses, opportunities, and threats. Clearly, the 20th-anniversary celebrations fall into that third category, she said, adding that the attraction’s leadership intends to use the many events and special programs on tap this year to introduce (or re-introduce) people to the carousel, with several goals in mind. These include everything from increasing direct ridership to booking more special events involving both children and adults; from recruiting more supporters to simply raising more funds. “The 20th anniversary is a time to reflect on the many things that we’ve accomplished here and be proud of those accomplishments,” Costello said. “But it’s also an opportunity to re-connect with our supporters and make more friends. As it did 25 years ago, the Friends group is reaching out to the community for donations, she said, adding that donors can become members of the merry-go-round’s Ring of Honor, a collection of brass plaques that bear the names of supporters ranging from Holyoke schoolchildren to businesses across all sectors. But long-term, the merry-go-round must be more successful with scheduling events, she continued, because they are both solid revenue generators and vehicles for generating future ridership and more get-togethers. 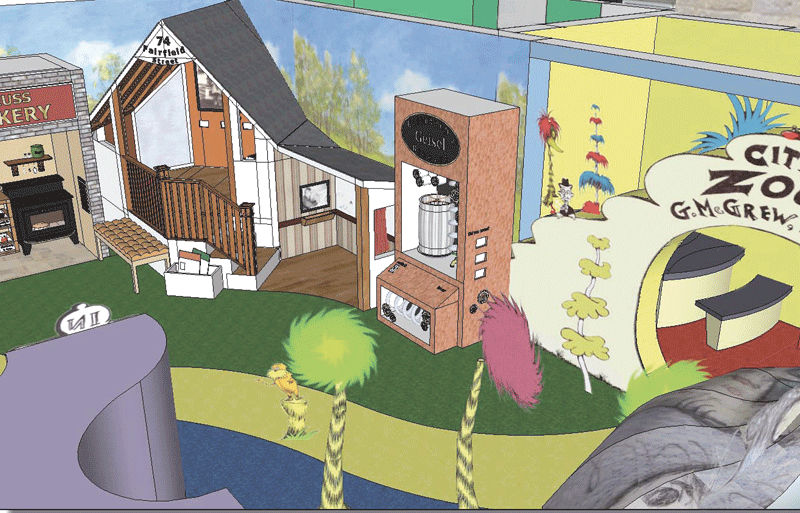 Overall, the ongoing assignment for the merry-go-round’s leadership team is to make the attraction — and downtown Holyoke in general — more of a true destination for families with children, said Jackowski, adding that there are many developments that are moving the city closer to that designation. PTC 80 has lived up to those words for more than eight decades, and especially in its new home in Holyoke’s downtown. Its first two decades there have been an extraordinary ride in every sense of that word. And that’s why this anniversary will be a time to celebrate, but also a time to make sure that the ride will continue for decades to come. Paul Ducheney says the fishway was the culmination of years of study involving fish behavior, as well as considerable trial and error. Paul Ducheney acknowledged that it’s difficult to look upon the elaborate, cutting-edge Frank E. Barrett Fishway and grasp that it was inspired by a net and a bucket. But it was. Well, sort of. As legend has it in Holyoke, in 1955, an Atlantic salmon was trying to make its way north on the Connecticut River, back to its birthplace to spawn, when it hit what was then a roadblock — the Holyoke Dam. The story goes that an engineer with what was then the Holyoke Water Power Co. caught the confused fish with said net, but then didn’t know what to do with it. 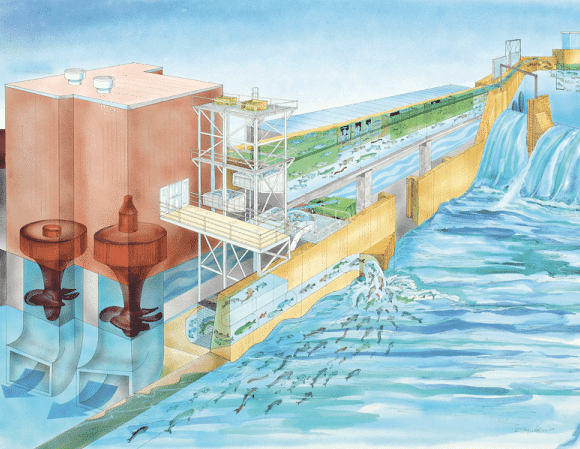 Today’s Robert E. Barrett Fishway is the result of that ongoing story of how, through the use of exponentially more sophisticated means of fish attraction and larger buckets, HG&E has created a fishlift that has become a model for hydropower systems in this country and around the world. The two-bucket system carries hundreds of thousands of anadromous fish — those born in fresh water (salmon, smelt, shad, striped bass, and sturgeon are common examples), and spend most of their life in the sea, but return to fresh water to spawn — over the dam each year so they continue their migratory journey north. And while doing so, it provides powerful lessons to visitors, many of them schoolchildren on field trips, about these fish, hydropower, and how they can coexist. This was the dream of Robert E. Barrett, former president of the Holyoke Water Power Co., whose imagination and perseverance made it reality. The current fishway, opened in 1955, hosts more than 11,000 visitors a year between April and June, when the fish make their annual treks north, said Kate Sullivan, marketing coordinator for the HG&E, who told BusinessWest that the facility is still far too much of a best-kept secret from a tourism perspective, and that the utility is working to see that it loses that distinction. For this issue and its focus on travel and tourism, BusinessWest paid a visit to the fishway for an educational experience on a grand scale — in more ways than one. 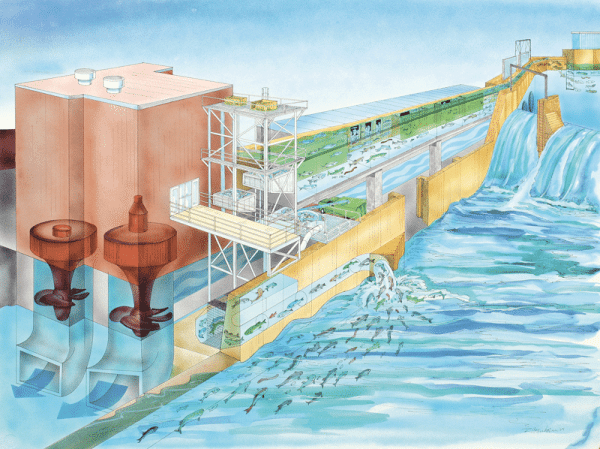 This illustration shows how the fishway enables migratory shad, Atlantic salmon, and other species to be collected, lifted in buckets over the dam, and released. As she gave BusinessWest a tour of the facilities, Sullivan said the creation of such facilities to ferry fish over hydroelectric installations became a federal mandate for those seeking to hold licenses for such facilities decades ago, and there are many such lifts operating today. But the fishway in Holyoke is somewhat unique because of the breadth and depth of the educational opportunities it provides and the large scale of the operation. Indeed, it is said to be most successful fishlift on the Atlantic coast in terms of the number of fish it ferries. For visitors, it’s an opportunity to see how nature and modern technology can collaborate and create some powerful images. Once through the entrance of the power station, visitors are led — on the right, past the giant HG&E turbines that harness the river’s power, and, on the left, past a series of historical pictures of the dam and older fish-assisting devices — out to the large outdoor observation deck. Standing high above the Connecticut River on the deck, they get a southern view of the river and the special canal, which shows the two ways fish enter the gathering area by way of a high-velocity water flow that attracts them to the main collection area just under the deck. Visitors can then turn their attention to the north and experience the sights and sounds of water coming over a section of the dam, next to the lift structure. On the half-hour, a buzzer rings, signaling the start of the fishlift as its two large buckets begin carrying hundreds of fish and water more than 50 feet up and into an exit flume. This is the point where visitors then move inside to see the fish swim by the public viewing windows, giving them the feeling of being underwater with the fish. Sullivan told BusinessWest that guided school-group tours take about an hour, which includes time for an activity. But that secret took some time to materialize. Kate Sullivan says grassroots efforts have helped increase visitorship at the fishway, which is open only a few months a year. Dams have been built to harness hydropower for centuries, and attempts to help fish on their migratory journeys have been part and parcel to those efforts, but finding a system that works effectively has often been a frustrating matter of trial and considerable error, said Ducheney, noting that Holyoke’s history serves up some good examples. Since 1794, several dams have been constructed at South Hadley Falls, where the river drops more than 40 feet, and in October 1849, a large ‘timber crib’ dam was constructed, preventing upstream fish migration. In 1866, Massachusetts enacted legislation requiring the construction of devices to permit passage of shad and salmon, which resulted in the first wooden fish ladder in 1873 — a system designed to replicate nature — on the South Hadley side of the river. However, the ladder was off the beaten path of the fish’s instinctual travels, said Ducheney, and fish passage didn’t go well; in fact, not one fish used any of the early ladders. Soon after, the aforementioned lucky Atlantic salmon was saved and lifted over the dam. The stiffer federal mandate had engineers building a different type of fish passage because others hadn’t worked. More research into fish behavior resulted in the reason why: fish needed to sense the sound and current of rushing water on their journey, where a dam now stood. The solution was to create a gathering area by way of a high-velocity water flow that attracts the fish to the main collection area just under the deck, and the first lift, using a bucket in 1955, was built under Robert Barrett’s direction — the first successful fishlift in the country. Today, fish can continue upstream migration (if they’re not collected for hatcheries), where fishways further upstream at the smaller Turners Falls, Vernon, and Bellows Falls hydroelectric projects also provide a means to enhance passage for migrating species through a simpler elevated step process. 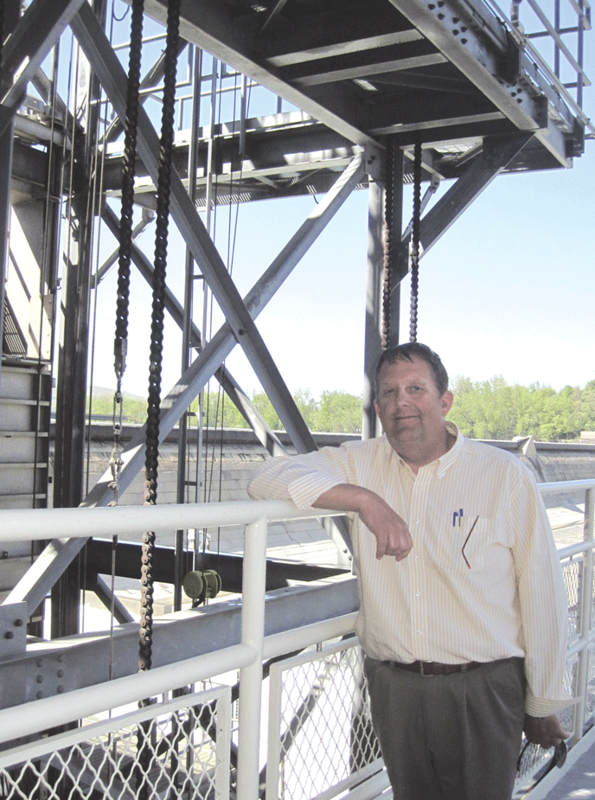 When HG&E purchased the Holyoke Dam to operate the hydroelectric facilities and the Holyoke Canal System, more improvements were made to the fishlift, Ducheney explained to BusinessWest. And the fishlift is a first for something else that’s important. “Literally, every fish is counted,” said Sullivan, noting that the Holyoke Dam is the first that fish encounter as they move north from Long Island Sound, so keeping accurate inventory is critical to tracking what happens to fish before and after they get to the Paper City. The counters are biology students from Holyoke Community College who click a designated counter for each species of fish in a special viewing room just past the public viewing windows; its another form of educational experience of which Barrett would be proud. Since the official counts started in 1965, the most prolific years for fish passage were in 1985 and 1992, at more than 1 million fish. In 2012, more than 500,000, mainly shad, were lifted over the dam. Shad, said Ducheney, is a river herring, and while that may not sound delectable, he noted that shad is actually on the menu at New York’s famous Tavern on the Green restaurant at this time of year. But restaurants aren’t the only interested parties when it comes to shad. The annual HG&E Shad Derby, one of the region’s largest fishing events, is held on two weekends in May and offers nearly 600 anglers of all ages the opportunity to win cash prizes and write plenty of their own fish stories as they enjoy the recreational benefits of the Connecticut River. Marketing funds are tight, Sullivan said, so getting the word out about the fishway is a struggle. But thanks to HG&E’s newsletter to 18,000 customers, as well as more comprehensive grassroots efforts over the past couple of years to increase awareness of the facility, visitation has increased. 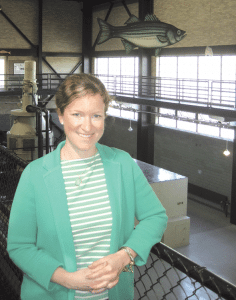 In just a short window of six weeks, from late April to mid-June, more than 11,000 visitors came through the fishlift last year, 2,000 more than in 2011, said Sullivan, noting that many of them are students from across the region. The fishlift is open Wednesday through Sunday, 9 a.m. to 5 p.m., until June 16, due to the spawning season each spring. Also open on Memorial Day, the facility offers visitors of all ages a unique combination of science through tourism, and a chance to tell a real fish story about the ones that got away — or at least further upstream.